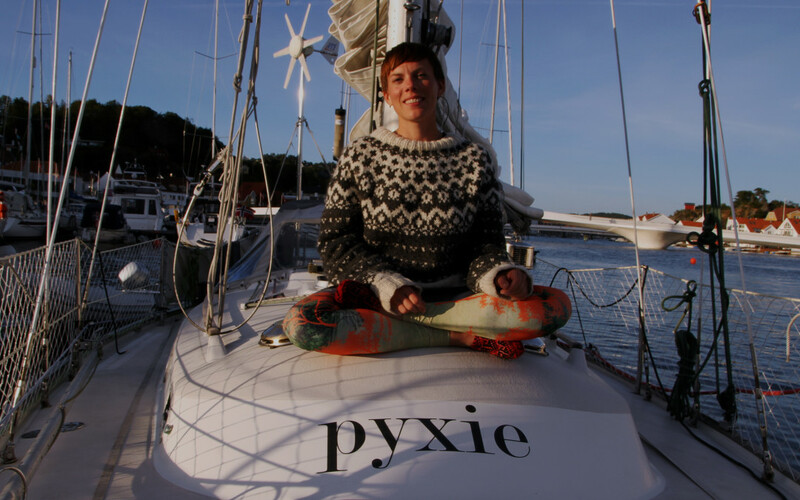 So far, the journey on Pyxie has not just been about the sailing, but also about the people we’ve met. Sure, I set out on this journey solo, but I’ve always planned on having crew on board for some of the legs. The first of these would be the rounding of Lindesnes, also called the Cape Horn of Norway. It’s the southernmost point on the mainland, and it’s all north from then on. Pyxie, Poesi and me hung out in Mandal for a few days, waiting for the wind to turn and especially for Ingvild, our first crew member, to arrive. Me and Ingvild had never met before. The bravery she showed in simply taking a chance, packing her bags and joining me does indeed say something about her character. I couldn’t have dreamed up a better crew member! Ingvild turned out to be super easy going, totally capable of anything I asked of her and absolutely in love with the sea. We had tons to talk about and hit it off immediately. She’s the kind of physiotherapist I want to go to, extremely smart, smiles a lot, dances a lot, loves water sports and has bruises from riding racing horses. She doesn’t realise it, but she’s a honey badger! In other words: Looks cute and innocent, but is totally badass. Guess who ended up steering the boat around Lindesnes while I just faffed around? After spending time as beach bums on Sjøsanden with a bit of hiking (a.k.a. running up hills and doing burpees) thrown in for good measure, not to mention a few epic meals, we got ready to set out. Well, not until the boat neighbour has a look at the electrical engine, she reminded me. A beautiful Najad with a friendly family arrived next to us the night before, and the dad immediately lit up when I told him I had an electrical inboard. He really wanted to inspect it, and I always value it when experienced sailors take a look at Pyxie’s systems. I’ve had some issues, not with the engine itself, but with the battery monitor, some seriously toasted cables, a faulty regulator to the wind generator, my refrigeration … the list goes on. As a part of the lucky streak that seems to befall Pyxie after her renaming, the curious neighbour turned out to be an electrician specialised in marine systems. And he pretty much insisted on fixing everything. I wasn’t about to protest that, and Ingvild gladly ran about town, locating new parts. Am I the lucky one or what? I felt like giving something back and did the very Norwegian thing of going to Vinmonopolet, where I found an aptly themed Thor Heyerdahl aquavit for my friendly electrican and his radiant wife. Such great people! That’s how I want to be when I grow up. They had been liveaboards on a boat pretty similar to Pyxie before they got kids, and seemed to be enjoying life and sailing to the fullest. I think enough sea and sun and wind can cause faces like theirs – bronzed and slightly freckled with small creases around the eyes from smiling. I am absolutely certain that they will have wonderful voyages their whole life, and that their kids will grow up to be capable, radiant people with an affinity for salty air and salty hair. So, with all systems primed we went for a slightly shorter leg than planned. But oh, was that ever a good idea! Smooth sailing with the breeze from just the right angle up to Båly, a fishing harbour and the entrance to Spangereidkanalen, the canal that allows smaller vessels to skip rounding Lindesnes. Well, they haven’t thought to make lift bridges, so no sailboats can go through. That’s quite all right, though. I wanted the experience of rounding the bend. It’s another milestone for me and Pyxie. As a bonus, we had the best time in Båly. For some reason we had noticed that there was a seaside hotel, and I figured they had to have a spa. Umm, correct! So instead of braving through some heavy winds the next morning we splashed around in a jacuzzi with a sea view. We set out for our rounding of the cape in the afternoon instead, with perfect conditions. Sure, it was raining cats and dogs. But that just added to the mystery and ruggedness of the lighthouse on the rock of Lindesnes. If the skies had been as pristine as the seas it might have felt a bit like cheating. We had another great sail with wind from astern and a gentle swell, swooshing us past at 6-7 knots. And just as we got inshore towards Farsund the wind died down. Well, I knew that from the forecast, but it was a blessing to reach just far enough before it happened. We ran the engine and she purred like a slightly introverted cat. Electrical engines are very quiet, you see. As we approached the harbour Ingvild threw out a fishing line and caught no less than four mackerels all at once. Happy cat and happy fish soup followed as we moored in lovely Farsund. Having Ingvild come with me reminded me of my own experience of crewing on a boat. I sailed with what has become one of my favourite couples in the whole world, Elisabeth and Anders, from Kiel to Falmouth. They sailed on to the Caribbean, and I went up to Bear Island. We’ve been friends ever since, and while sailing down the coast of Norway I got the opportunity to visit them in their new house and new life in Lillesand, celebrate Elisabeth’s birthday and especially see her beaming with twins in the making. Funnily enough another couple with twins is the wonderful couple I bought the boat from, Espen and Svenja. And they were just around the corner too, in Homborsund. So I’ve had a trip full of friends so far, both old and new. I’ve met my old boat neighbour (another Espen! ), and got to use his berth in Son. I sold a windvane that didn’t fit on Pyxie to Peder in Risør, who also promptly fixed a free berth for me, and helped me out with all kinds of errands. And in a magical anchorage called Udvår I moored longside with a Danish couple of the very best kind, helping me repair my torn-to-pieces sprayhood and offering me little presents and stories from their voyages. And let’s not forget all my wonderful landlubber friends who help and support me on the way. I love all of you! Now Ingvild has taken a bus to Kristiansand and I have the blues. No, just kidding, it’s fine. That said, Ingvild is more than welcome back any time! And right at the end here, a little bit of yoga hippie flower power philosophy: We are all the lucky ones. See, it’s supposed to mean bad luck to rename a boat, unless it’s done right. There might be many reasons for this belief. One theory is that renaming a boat without asking the gods of sea and wind for permission might cause anger and thus misfortune for the ship and crew. A more likely, but sightly boring one is that a commercial ship that had clearly been renamed might be a sign of bankruptcy. No matter the reason, I do believe in infusing life with a bit of magic and ritual. It makes me feel connected to whatever it is I set out to do. And in this case, it made me feel connected to the boat itself and the powers of the sea and the wind. It’s quite simple, really. It’s about attention and reverence. The ocean is vast and enourmously powerful. Giving a bit of thought to that, and carrying out a ceremony or ritual that somehow shows humility is never a bad idea in my opinion, if only for the sake of my own mindset. So I decided to do the renaming right. Not necessarily right as in following the rules set out by someone else and spread across the internet. Just right according to my own intuition. The full moon does have a lot of power, whether you call it scientific or magical. And on July 31st there was a Blue Moon. Not as in a moon with the colour blue, but a phenomenon that occurs only once every two to three years where there is an «extra» full moon, in this case a second full moon within a month. It is thought to be eeextra magical. In addition, this night marked my last night sailing solo for a while, and also being at the southernmost point of Norway before rounding the cape of Lindesnes and turning north. So I really couldn’t find a better moment to carry out a little renaming ceremony. I did remove all traces of the old name first, and cleaned the boat thoroughly both inside and out. Then, as night fell, I sat on the bow communing with the powers of the sea in my own way. And, yes, I sacrificed a little bit of wine for the gods too. When that was done, I placed the vinyl stickers with Pyxie on the boat. And, lo and behold, just as I had stuck the name on and was ready to draw the covering film off someone sent up fireworks! Yes! Pretty decent fireworks too, as it turned out. I then made another toast and sacrificed more wine to Poseidon, Aeolus and Yemanja, asking them in turn for their protection for my little ship. It just felt right, and I had a very happy night. Now I am ready to round the corner and go north with a properly named boat. Cheers to the wind who seems to be turning in our favour tomorrow. May we sail safely with a gentle breeze in our backs. A smooth sea never made a strong sailor and all that. Well, the sea has been pretty smooth and so far the biggest issue has been getting enough wind in the sails – and not just from the direction I’m going. Southerlies prevail as the dominant wind direction in the Oslo Fjord. I can imagine why the vikings decided to just settle at the bottom of the fjord, or Viken (yep, that’s the origin to the word “viking”). I mean, when you’ve sailed (or rather, been blown) up the fjord it’s damn hard work getting back out of there. Especially with the sailing technology of the viking era. The ships back then were excellent downwind, but not so great the other way around. As a matter of fact, the first time I sailed up the fjord – at what I thought was a pretty decent 7-8 knots – I was outsailed by a copy of the Oseberg Ship. Going back out means tacking against the wind. That’s not what the viking ships were best at. And it takes a while with my boat too. But I did make it outside the Drøbak Sound in the end. And a fine sail it was. I caught a cod for my cat, and saw a dolphin! Well, it was actually a harbour porpoise. Swallows were circling my boat as I left and now this. Good omens? And what about phosphorescence in the head (that’s the toilet, for those of you who don’t speak sailor)? It’s got a wonderful name in Norwegian; “morild”. And a bit of research tells me that it’s called “mareel” in Shetland dialect. I wonder if that’s influence from the vikings again, or if that word has other origins? Any linguists out there to enlighten me? I’ve spent a couple of nights in Son, an idyllic town that had been a natural harbour since – you guessed it – the viking era. My boat neighbour through the winter is possibly the only other Wauquiez Centurion 32 owner in Norway. We’ve become great friends and he keeps his boat here at the moment. And by chance he hauled out just as I was sailing in, so I got to use his berth. Lucky me! It felt great to visit a friend and celebrate that I have departed. Well … Here comes the reason for the title. I had to make a quick return to Oslo. Pretty annoying, but it had to be done. I ordered stuff for the boat on ebay and asked that it please be shipped in a way that didn’t require ID to be collected. Guess what? It required ID to be collected. Meaning that my brother couldn’t go get it and forward it to one of my destinations. So I made a quick decision to just hop on a train now, before I got too far away from the city. It felt really weird, almost unreal, to be in Oslo, even just for a few hours. I wasn’t supposed to be there. It felt a bit like skipping school. What if someone saw me? Well, someone did! I was inhaling some pretty decent pizza at Østbanehallen while waiting for the train back when a couple of the excellent 4 Gringos guys walked past. They looked very confused to see me. I mean, they had been there making delicious tacos at my farewell party! We talked a bit and had a laugh about it. Which reminds me to say thank you once again, guys! You rock! Having the taco van parked right by the beach really made a difference for the farewell party. And what a night it was! Gorgeous weather, the boat moored just across from where we did yoga, some of my favourite people in the whole world within arms reach for a hug or two. I couldn’t have asked for more. It makes me feel so damn lucky. And now I’m out on my big adventure. Haha, two days of sailing out, and still only an hour away by train. Sailing is not fast. But, then again, it’s not just travelling. I am moving around with my entire house. Like a snail. I’m calling it snailing (I know, not very original). How long would it take you to pack up all your stuff and get settled into a new flat in a different town? Longer than hopping on a train for sure, and probably longer than sailing there too, right? As a way of honouring my quick “there and back again” I also picked up my illustrated copy of Tolkien’s works at my brother’s place before taking leave once again. At the pace I’m going I should be able to read it before arriving in Lofoten. Heh. There’a a first time for a lot of things when buying a boat and embarking on a sailing adventure. I had very little sailing experience before purchasing Pyxie, and no experience at all singlehanding a boat. I firmly believe in facing fears and aquiring new skills, so I set out on this journey solo. Well, not entirely solo. I have Poesi the cat, my companion through the last seventeen years, with me on the boat. She has been appointed First Mate, no matter if I get more crew onboard along the way. And if sailing is fairly new to me, it is entirely new to her. 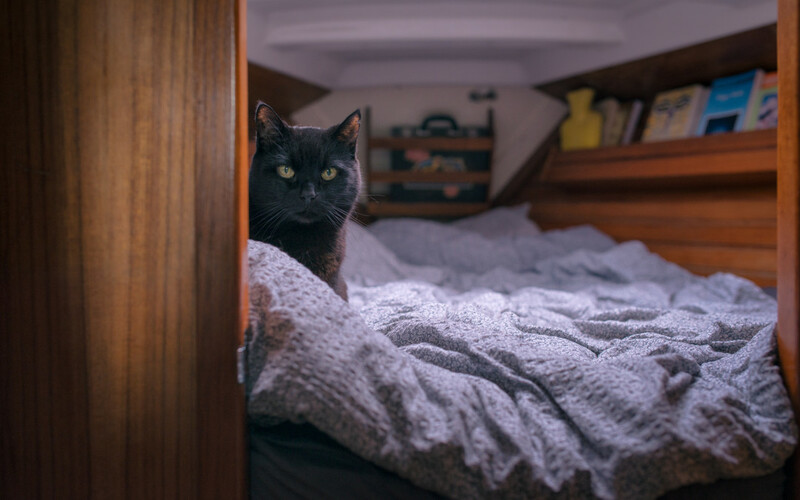 She has lived with me on the boat since Easter, and she is thoroughly enjoying it. But I had no idea how she would react to the open sea. To get her adjusted to life at sea, I have made a conscious decision to keep the sailing days short in the beginning. The Oslo Fjord is a great place to start in that respect. No swell and plenty of anchorages make it a good place to get used to things. So we’re not setting any speed records. But what about the open sea that lies beyond? We had a slightly rough first encounter with the Skagerrak. I made a pretty lame choice of leaving a calm anchorage hours before the wind would change to a favourable direction. It didn’t seem too bad. But there are shallows west of the lighthouse Færder, and with wind against us and current in the opposite direction it got a bit choppy pretty quickly. And the wind increased. Did I reduce sail in time? No, I didn’t. Soon we were tacking against a strong breeze and with waves crashing over the boat. Nothing too bad, but quite a lot of movement for a small cat. So naturally she got a bit scared and seasick. She puked the tiniest of pukes in my bed and hid under the covers. Where she peed. Nice revenge, my dear. I turned into Mefjord and sped past the rocks at about 7 knots. Found an anchorage … just in time for the wind to turn. Pretty annoying. But Poesi was back to her old, perky self in no time and we slept well. 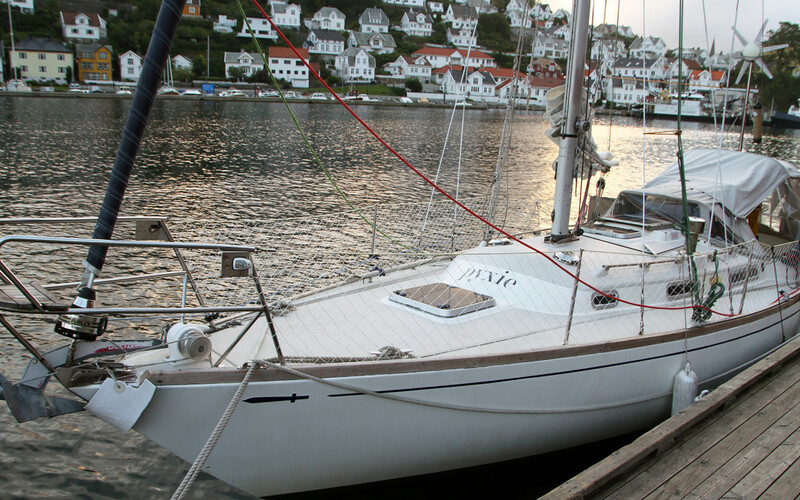 Maybe not such a bad idea after all, because we got an early start and had a glorious sail to Risør the next day. It actually proved to be perfect. The forecast was SW force 7 and waves of about 3m the day after our arrival there, which would have made for a bumpy passage for the both of us. In addition I was bringing a windvane to a sailor in Risør, and he proved to be immensely kind and helpful. We got a free berth (this seems to be a lucky streak!) for as long as the wind would blow from the wrong direction. Batteries charged, water filled and provisions stowed, we are now just enjoying the idyllic, white town and doing bits of maintenance on the boat. The “fix this” list is like the jar of Sarepta – it never runs out. I’m ok with that. And Poesi is enjoying herself, cuddling under the (now clean) duvet or inspecting my work in the cockpit. She is a curious, old cat and it’s not killing her. Actually, you can follow her reports from the journey on instagram! Check out @karinella (that’s me) or the hashtag #yoginigoesbear. Gorgeous photo by Carsten Aniksdal. The rain is drumming hard on the decks of SY Pyxie today. You might think that would be as good a reason as any to sail south, south, south. Because every Norwegian knows it’s never cold or rainy further south in the world, right? I’ll get back to you with updated observations on that … next year. Because this year I’m sailing north. I’m sailing home to Lofoten. Well, in many ways the journey will be an exploration of what home really means. Because I’ve created my own home on the boat – a home I can take anywhere. There’s a saying among liveaboards that goes “home is where the boat is”. And I’ve sometimes privately tought that “home is where the cat is”. Good thing she’s with me on the boat, so the two philosophies coalesce. Still, I adore the fjord where I grew up, and long for it. And I just couldn’t set out on a journey out across the seven seas before I had sailed in my own waters, explored the mindbogglingly beautiful coastline of Norway and gone back to the beginning. Also, my mother is severely ill, and I want to be with her and give her all that yoga has given to me before I go anywhere else. Along the way I will make stops to do free yoga classes, explore remote places, visit farms and forage wild foods. I’ll turn the ingredents I come across into the most unauthentic, but tasty taco imaginable! Above all I will meet people who have followed their own dreams, gone their own way and created their homes along the coast. I’ll visit a surfboard shaper who is making a longboard for me, a freediving yogini who’ll teach me to hunt (for seaweed in my case, I predict), traditional boat builders, beekeepers and salty dogs, among some. 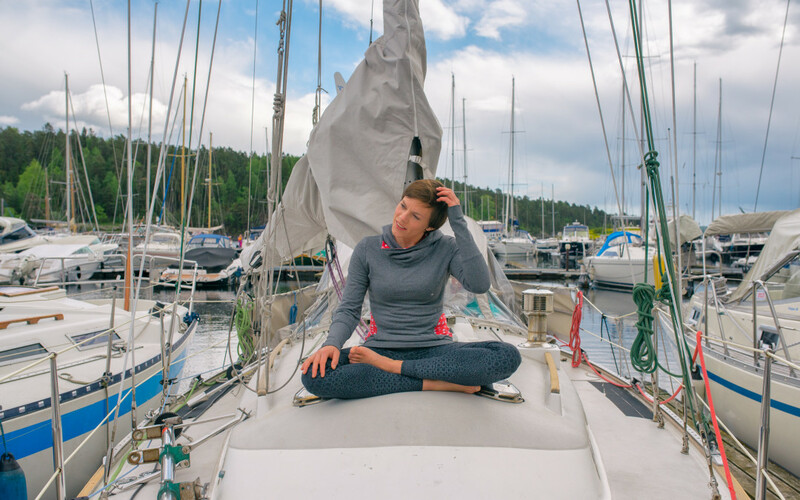 And then it’s on to Bjørnøya (Bear Island) … That’s where I’m going after my sailing adventure, and after having completed the Support Nepal Yoga Trek in October. You are most welcome to join me in Nepal, and I will explore and give a taste of some ideas and concepts during that adventure, ideas that will eventually turn into something bigger. I’m not going to spill all my beans, but I can tell you that it will be digital and personal at the same time. That’s what I plan to spend the winter on Bjørnøya developing, as well as working at the meteorological station up there. 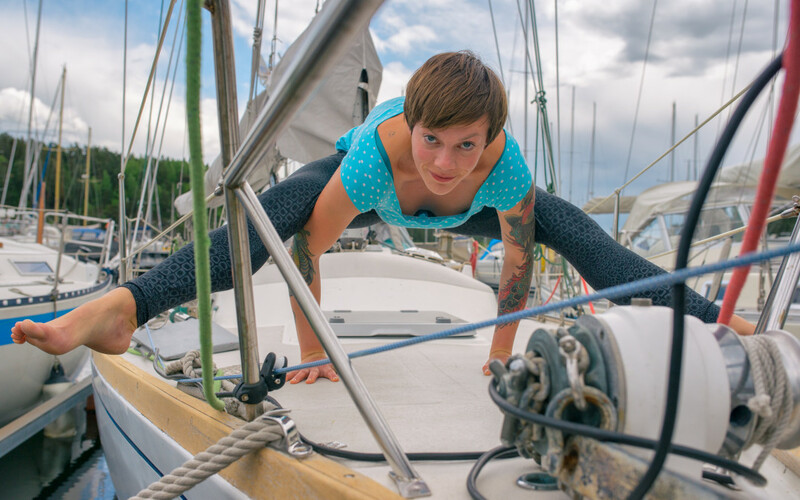 But before winter comes summer, and the yogini sailing adventure. If you’re in the Oslo area, come join the farewell party on July 11th! I’ll rename the boat properly to appease the sea gods and we’ll do a grand picnic on the beach – with tacos! If all goes to plan, 4 Gringos will park their taco van right nearby. Bring a towel and hopefully not an umbrella. The event is at Bygdøy Sjøbad at 18.00, Saturday July 11th. We’ll start the evening with a free yoga session! Last winter I spent six months on Bear Island, isolated in the Barents Sea. There is no settlement there apart from a meteorological station with a rotating crew of nine. I was lucky enough to be one of them. 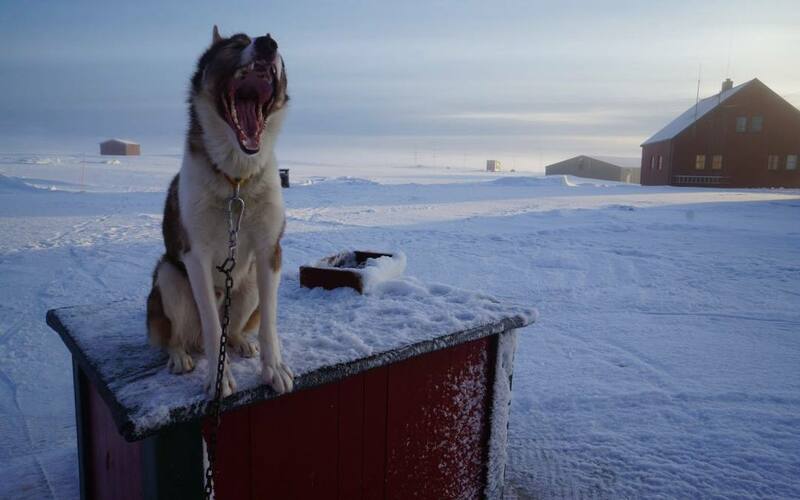 Believe it or not, dogs can be impressively effective guards against curious, hungry or aggressive polar bears. 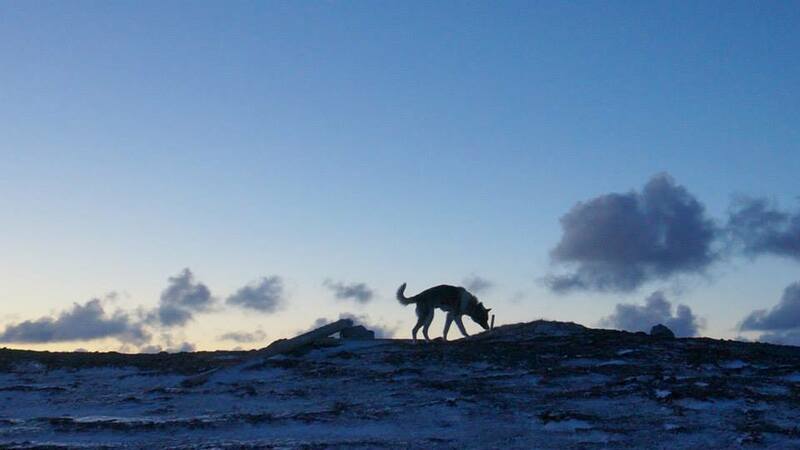 Throughout the history of the island there are plenty of examples where the dogs have not only notified the crew of an approaching bear, but also actively chased the bear away. Nowadays, with a decline in sea ice, bears are a rare sight on the island. The dogs, however, are still tremendously important to the crew. They are trusted hiking companions and someone to confide in. The Nine, as I chose to call the crew last winter, didn’t go all the way to an isolated island in the middle of nowhere to hang out with other people all the time. Sometimes we needed to be apart, not because we weren’t friends, but just because solitude was part of what drew us there in the first place. And sometimes the unconditional joy and love of a dog is the purest and sanest thing on the planet. All of us grew fond of the dogs, and a few took extra responsibility and care of one each (or two in the case of Eerkki and Aki – they are always together). It had to do with interest and simply with connecting, finding a buddy. For me it was obviously going to be Laban, the youngest and most unruly of the bunch. A recurring favourite moment happened every time I put on my anorak and a knapsack, picked up my rifle and walked out the front door to load. In a split second Laban would jump up on the roof of his house and go into a frenzy. He’d whine and wee himself from pure excitement and joy. Getting him to stand still long enough to get the leash and harness on could sometimes be a challenge. But one of the great pleasures of getting to know a young dog is to watch him learn and develop. Laban changed so much in the six months I was there! He went from a gangly teenager to a young stud. He learned to skijor (pull a cross-country skier) and quickly grew to understand that running in circles or making quick turns was a really, really bad idea when attached to a person with skis. Well, the one that had to suffer through those experiences was actually me, and I did aquire some interesting bruises and battle wounds along the way. Still, he didn’t want to hurt anyone, and pretty much got the technique after my first major fall. Or it might have been that one of the others is more apt at training dogs and taught him the ropes while I was at work. Who knows? My worst moment during the whole stay also involved Laban, but it was all my own fault. We went skiing to a cabin, just me and him, and had a great time. Two days of exploring, playing in the snow and cuddling. On the way back I let him run loose because I wanted to take pictures of the old, ruined mining town at Tunheim. Bad idea. We were close to Brinken, the cliff that plummets into the sea around most of the island. It is the home of thousands of sea birds, and Arctic fox hunt along it, even running down the cliff itself. As I was skiing along, Laban disappeared out of sight. I stopped to call him, but couldn’t see him anywhere. I kept going, and stopped intermittently to call for him and take some photos here and there. The landscape wasn’t entirely flat, so I expected him to pop up from behind a rock or come sniffing one of the rusty train carts at Tunheim at any moment. Only he didn’t. I started looking for tracks, and called for him some more. No Laban. That’s when I got really nervous. Being so close to Brinken, and seeing plenty of fox tracks left me anxious. What if he had run after one? Being so young and eager (a.k.a. stupid), he might even try to follow it down the cliff. Horrible images of Laban tumbling down into the sea or smashing against the rocks entered my mind, and I got really scared. I went along the edge of the cliff, searching for tracks and calling, calling, calling. I made my way back in the direction of the cabin, painfully slowly, to search for him. If he had fallen, the least I could do was find him and make sure he wasn’t in pain. No matter what that might involve, it was my responsibility. I had a gun, after all. Tears and snot froze to my faux fur hood. The north east started to blow and the clouds loomed above me. The last thing I needed was a complete whiteout. Finally, after two hours, I saw the cabin in the distance. And guess who was sitting politely in front of the door, waiting for me to come back? There he was! I guess he was just enjoying cabin life so much that he wanted us to stay. When we finally returned to the station I had missed the birthday dinner of Mikael, our cook, and I was a complete wreck. My throat and voice didn’t recover for days from screaming my heart out. But that really didn’t matter. Laban curled up in his house like nothing had happened. And, well, nothing had. Except me being a stupid, stupid girl. Right now you can watch our adventure on TV! The National Broadcasting Corporation sent a team up and the result is a documentary series in six parts. NRK 1, every Tuesday at 20.15. You can stream it here (depending on your region).